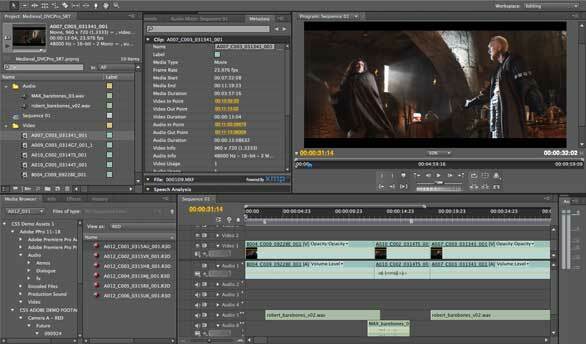 Adobe has launched Premiere Pro CS5, an upgrade of its professional nonlinear video editing package. With it, Adobe has introduced the Mercury Playback Engine, a technology that allows users to open projects faster, refine effects-rich HD sequences in real time, experience smooth scrubbing, and play back complex projects without rendering. Among its other new features are expanded support for native tapeless workflows and open project interchange with Apple's Final Cut Pro and Avid's Media Composer. The Mercury Playback Engine is 64-bit native and optimized for Mac OS X, multicore processors, and nVidia CUDA GPUs (graphics processing units) to provide fluid, real-time editing. This technology lets video professionals maintain full frame rate, at full resolution, when applying multiple color corrections and effects across video layers, and when working on complex timelines and long-form projects with thousands of clips—whether in SD, HD, 2K, or 4K. Editors can open large projects up to 10 times faster, Adobe says, and mix and match AVCHD, P2, XDCAM, RED, and DSLR camera formats in the timeline, without rendering. The company reports significantly faster in-field editing on laptops and with mid-range systems with Premiere Pro CS5. Adobe states, "...the productivity gains measured in independent benchmarks conducted by Pfeiffer Consulting demonstrated up to 10 times performance increases over earlier versions on effects-heavy, high-resolution projects." With Premiere Pro CS5, users can import and natively edit video shot with Canon, Nikon, and Panasonic DSLRs without transcoding or rewrapping. It now features support for XDCAM HD 50, AVCCAM, DPX, AVC-Intra, and RED R3D. Premiere Pro CS5 lets users share projects and assets with Final Cut Pro, Avid Media Composer, and Digidesign Pro Tools software, without conversion or rendering, while preserving commonly used effects and transitions. It is extensible via panels created in Adobe Flash Professional, enabling broadcast and film companies to use the software in integrated workflows, with asset management and file transfer systems, and newsroom systems such as ENPS. The Premiere Pro CS5 package includes companion programs, OnLocation CS5, Encore CS5, and Media Encoder CS5. Premiere Pro integrates with Adobe Story, an online collaborative scriptwriting service to improve production and post-production workflows, and part of Adobe's new CS Live online services. Integration with CS Review, another online CS Live service, will not be available in initial shipping versions of Adobe Premiere Pro CS5, but will be available in the future. Premiere Pro CS5's collection of apps requires Mac OS X 10.5.7 or 10.6.3, the latter of which is required for GPU-accelerated performance. The program is $799, with an upgrade price of $299. It is available in the Production Premium and the Master Collection. It ships within 30 days.